Yesterday was a perfect day, except, possibly, for the cool weather! I had the pleasure of listening to the final set of presentations in both my undergraduate and graduate class and the professionalism of the student presentations and the excellent content was so very gratifying. We lingered after both my Humanitarian Logistics and Healthcare class with hugs and took photos and after my Network, Game Theory, and Variational Inequalities class. Hard to believe that the semester is over with the exception of grading and graduations! 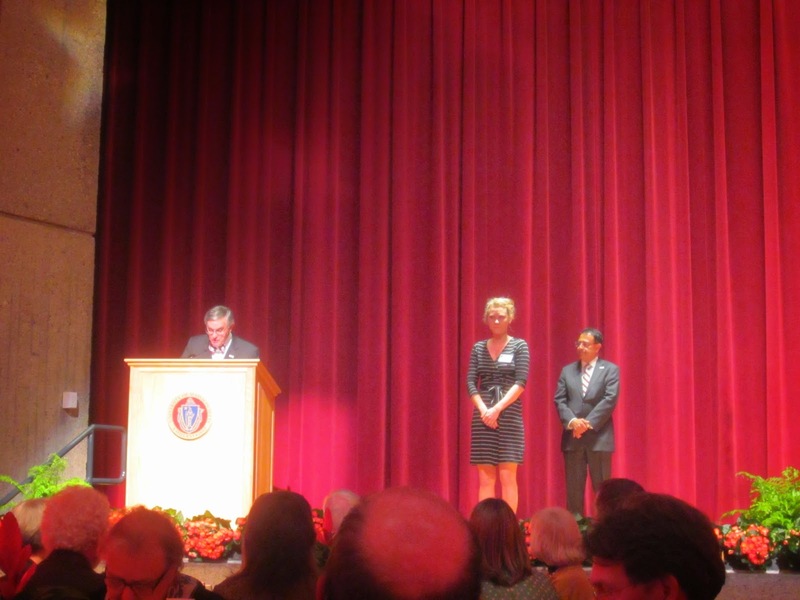 Yesterday was also Founder's Day at UMass Amherst and we celebrated 151 years throughout the day, culminating in the 2014 UMass HONORS Dinner at the Campus Center that I attended with my husband. It was the perfect ending to a great academic year - the food was extra delicious and the ambience elegant and warm. But, best of all, was the celebration of extraordinary achievements of our faculty in terms of research, teaching, and outreach. 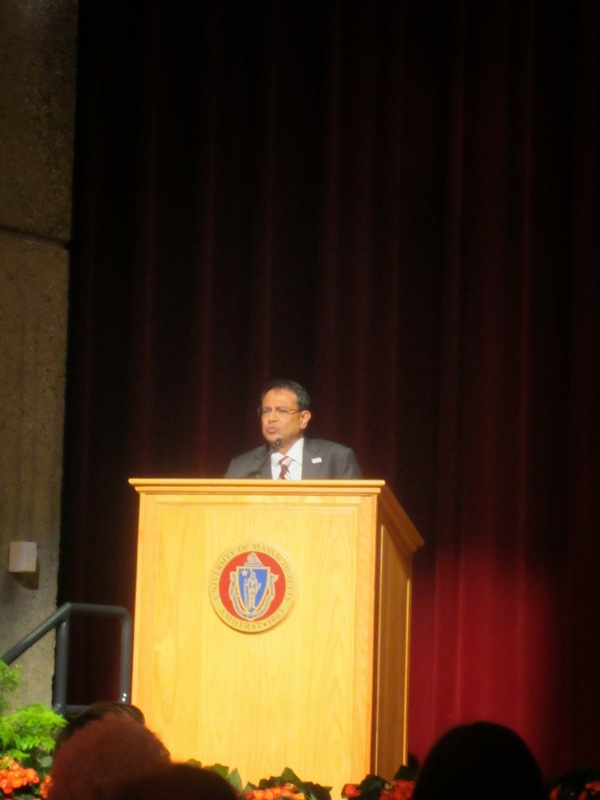 Chancellor Subbaswamy was a wonderful emcee and I LOVED his speech in which he shared stories of UMass Amherst Deans, including our Isenberg School of Management Dean, Dr. Mark Fuller, and their reflections on their first research experiences. 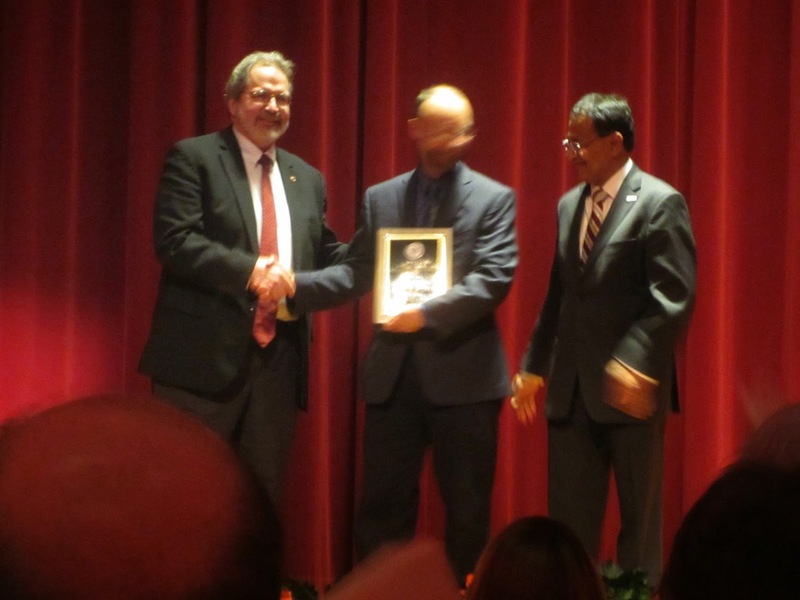 Our Chancellor also noted how he, in 1972, as a young graduate student from India at Indiana University, and was inspired by Physics Professor Larry Shuman, who was working on Catastrophe Theory. And, when asked why is a physicist working on catastrophe theory, which was new and novel then (and I still find the subject fascinating), he answered because it was fun! Yes, knowledge-driven research is the kind of research that elevates, energizes, and leads to true innovation! I so enjoyed seeing many colleagues from the College of Engineering, Natural Sciences, and Humanities and Fine Arts at the dinner and reception that preceded it. I am so proud to be associated with such great minds and such special people and institution. The Chancellor was assisted with the emceeing by Provost James Staros and our Vice Chancellor for Research and Engagement Mike Malone. I also very much enjoyed hearing excerpts from letters written in support of this year's Conti Faculty Fellowship recipients - the geoscientist, Dr. Robert DeConto, the computer scientist, Dr. Andrew McCallum, whose work has been cited over 35,000 times (and who spoke in our INFORMS Speaker Series at the Isenberg School), and the historian, Dr. Marla Miller. 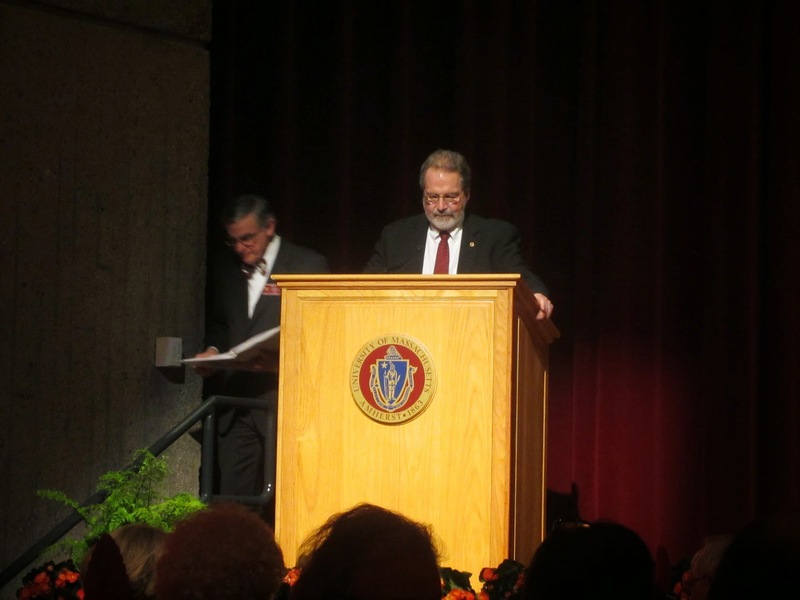 Congrats and thanks to all the faculty who make UMass Amherst such a special place to conduct research at and to teach at. I received a Conti Fellowship as an Associate Professor and spent that year as a Visiting Scholar in Management Science at the Sloan School at MIT. And, amazingly, last evening I was seated next to Ms. Susan Coltrane Lowance, who is married to Professor Lowance of the English Department. She was in the second class of MBA recipients at Yale, went on to become the Director of the Management Program for women executives at Smith College and then became the first female Director of the Sloan Fellow Program at MIT. It was so great to reminisce about my colleagues in operations research and management science there and about MIT and even Harvard, since Professor Lowance knows the President of Harvard, Dr. Drew Gilpin Faust, who was the Dean of the Radcliffe Institute at Harvard when I was a Science Fellow there. And, would you believe, Ms. Lowance told me that she attended the previous Harvard President's inauguration (Dr. Larry Summers') and even met a couple standing by the wayside with Summers name tags - yes, they were his very proud parents! Needless to say, what a perfect evening with such interesting people in attendance and such great stories! There is always serendipity in showing up as I tell my students. This is a VERY busy time of the semester in academia and the academic year with many deadlines but also celebrations. 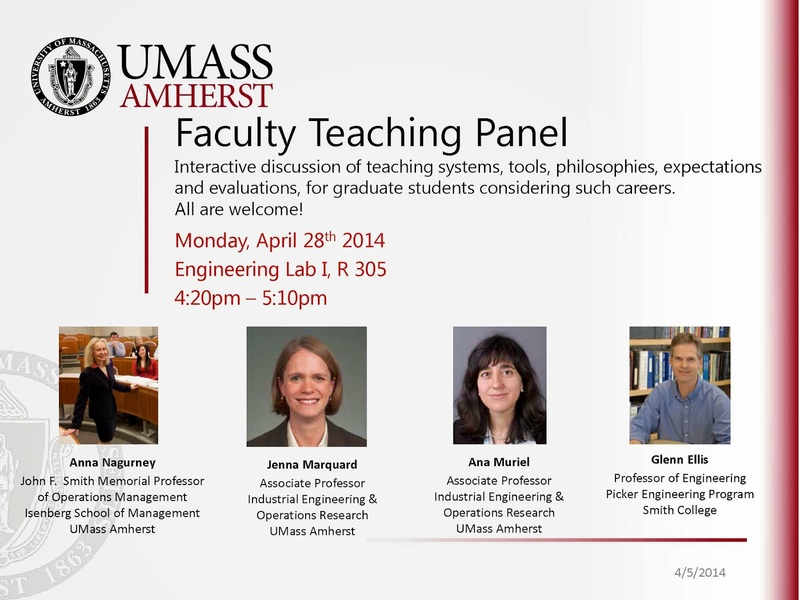 Nevertheless, when the invitation came from Professor Ana Muriel of the Department of Mechanical and Industrial Engineering at UMass Amherst to take part in a Faculty Teaching Panel, I had to say, "Yes!" Because where would we be without our students?! Do join us this afternoon, if you can (and I will try to write up some highlights on this blog afterwards for those who can;t make it) , for an event that I am sure will be very informative and interesting for all those grad students who are interested in pursuing an academic career and will be teaching soon, if they are not already. We can learn so much from one another. Last evening I had the pleasure of attending the 2014 Isenberg Scholarship Celebration, which took place off-campus at the Log Cabin. 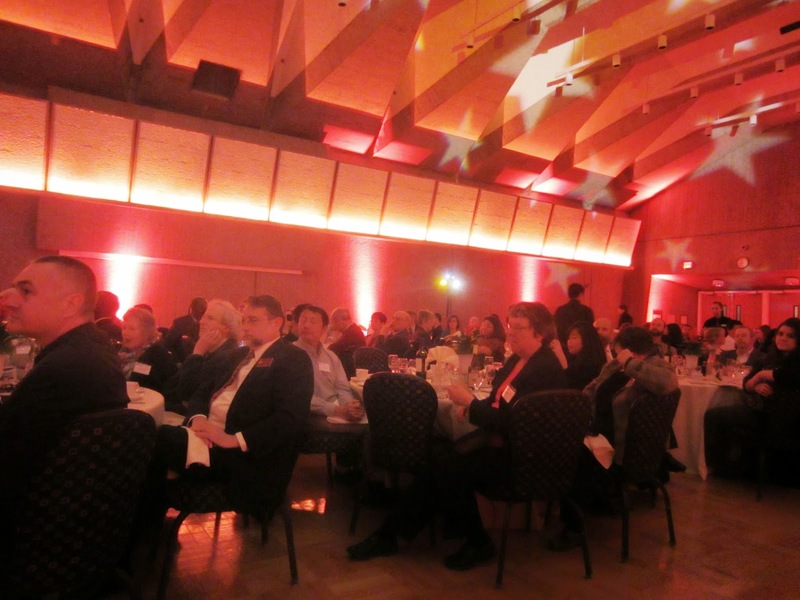 The venue was beautifully decorated with flowers and balloons, in maroon and white, of course, the UMass Amherst colors. 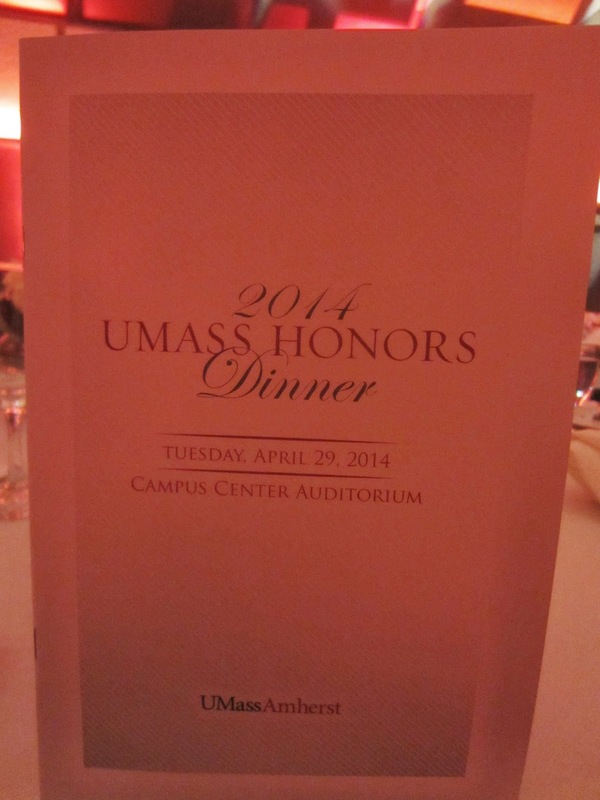 We had been attending this special spring recognition ceremony, which for many years had taken place at the UMass Campus Center. Yesterday's event was extra special because my family and I had been giving over quite a few years towards an endowment established to create a scholarship for a student and, yesterday, we had the joy of seeing the first Nagurney Scholarship awarded to an undergraduate Operations & Information Management student, who is both a scholar and a true gentleman. The hor d'oeuvres were elegant and the desserts sumptious but the best part was seeing the student scholarship recipients and their many benefactors, who include alums, members of the community, as well as faculty. Education, as was emphasized yesterday, especially by our Dean, Mark Fuller, is the greatest gift that one can get and receive. 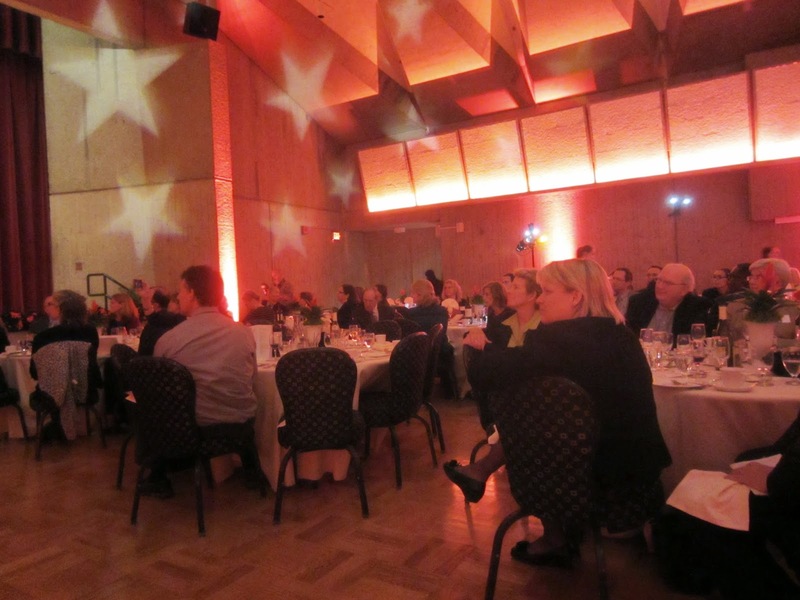 Our Associate Dean Dr. Linda Shea further emphasized that scholarships enable our students to realize their dreams. All the presentations were wonderful, including the student and alum ones, and I enjoyed hearing our Development Officer, Andrew Clendinneng, who is Canadian (I was born up north there, too), speak of the friendships he has made with our great alums. It was also terrific to have one of my doctoral students, Sara Saberi, present. 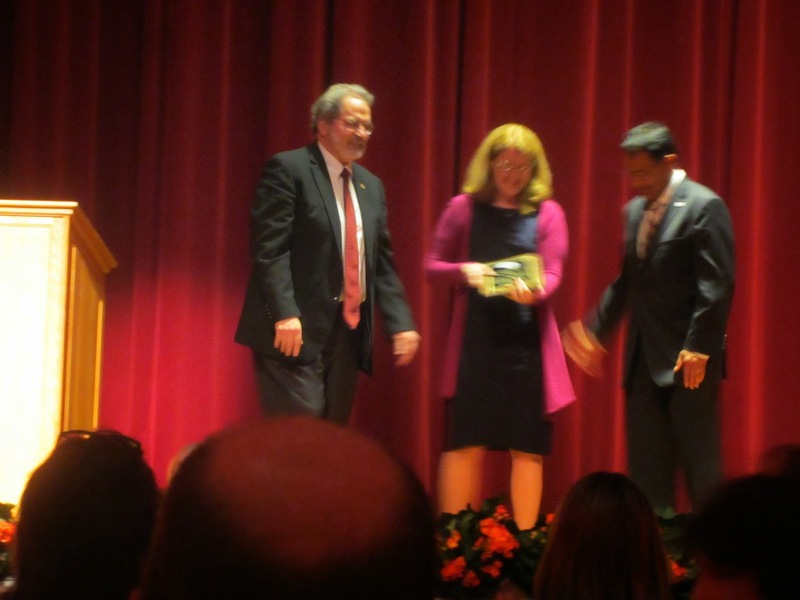 She was there because she is one of the ten recipients of the 2014 Isenberg Scholar Award. Her concentration is in Management Science and she is working on our NSF-funded multiuniversity project on Network Innovation Through Choice. Gene Isenberg, after whom our School of Management is named, would have been so proud to see the students, family members, faculty, benefactors, and staff present yesterday evening. Sadly, he passed away on March 16, 2014 but left a tremendous legacy. The Isenberg School is truly on the rise and, best of all, we have tremendous students that we have the privilege to teach and to conduct research with. Congratulations to all of the scholarship recipients - you make the donors and faculty proud! Thanks also to our wonderful Isenberg Editor, Lou Wigdor and former Dean Dr. Tom O'Brien for all that they have done to get us to this point. I received a stunning invitation in the mail yesterday, which brought back so many pleasant memories. The invitation was from the Radcliffe Institute for Advanced Study and the invitation was for a celebration of 15 years since its founding and also 135 years of Radcliffe. In 2005-2006, I spent a sabbatical at the Radcliffe Institute for Advanced Study at Harvard and was one of 12 Science Fellows that year. I had an office in Putnam House on Brattle Street, one of my favorite streets in Cambridge, MA, because of its location next to Harvard Square and also its history. I loved working that year on my Supply Chain Network Economics book, talking with fellow residents of Putnam - an engineer, sister physicists, linguists, and a computer scientists, and a French mathematician (Pierrette and I still stay in touch). Radcliffe generously also supported two of my female collaborators that year for several months when they visited me. I also so much enjoyed the lunches filled with conversation across disciplines because that year (and this is another aspect of the Radcliffe Institute experience that is so special) we had novelists, artists, historians, film-makers, a psychiatrist, and other trailblazers, among us. I also very much enjoyed the talks that the Fellows gave and the various formal and informal get-togethers around Harvard and Cambridge. Radcliffe is very special and its Institute for Advanced Studies is a true gem of scholarship and collegiality. ORMS Today featured my essay on that very special year - thank you, INFORMS, for the great support of your members! Dr Elane Chew, then of USC, followed in my footsteps, a few years after my Radcliffe year, and I believe that we are the only operations researchers to have been Science Fellows, thus far, and I hope that there will be many more! 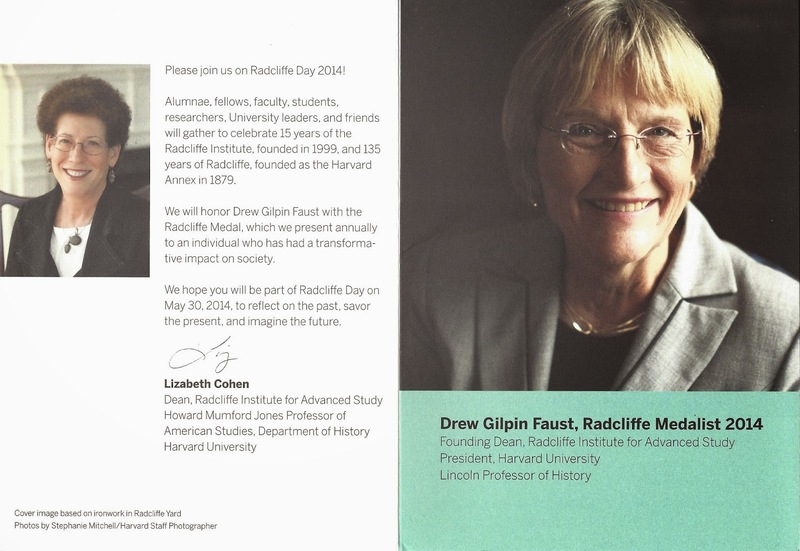 Some of you may know that the present President of Harvard, who is also its first female President, Dr. Drew Gilpin Faust, was the Founding Dean of the Radcliffe Institute and she was its Dean when I was there. Dr. Barbara Grosz, a renowned computer scientist, was the Science Dean then. 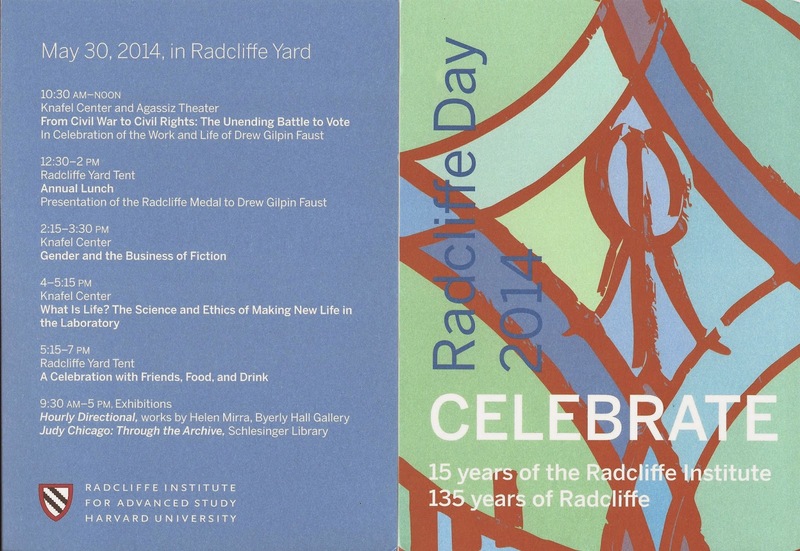 To mark 15 years of the Radcliffe Institute and 135 years of Radcliffe, there will be a celebration on May 30, 2014. Also, Drew Gilpin Faust will be receiving the 2014 Radcliffe Medal. I RSVPed my regrets - I will be in Sweden during Radcliffe Day 2014 - but through this post I wanted to reflect and reminisce and also to thank Radcliffe and the Institute for its support of interdisciplinary scholars and its vision! Wishing everyone at the Radcliffe Institute for Advanced Study much continued intellectual discourse and discoveries and, again, thanks for such a great year and for the friendships made! Today is Earth Day on which we celebrate planet earth and the environment. I have been hard at work on a presentation, Sustainable Supply Chains for Sustainable Cities, which I will be presenting at a fascinating workshop, which will take place in early May, at the Ettore Majorana Scientific Center in Erice, Sicily. I had been then before, back in 2006, and it was a fitting ending to not only my year as a Science Fellow at the Radcliffe Institute at Harvard but also to the World Cup (Italy beat France and we were in Italy). The title of the Workshop that I will be speaking at is given below. 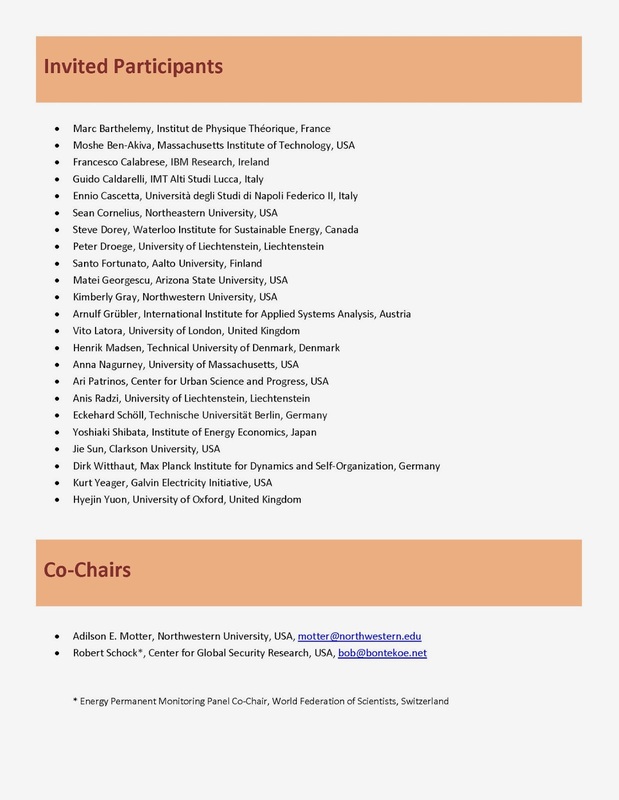 Workshop on Energy, Cities, and the Control of Complex Systems. The list of invited participants is below. In my presentation I will present both a supply chain network design model with a focus on frequencies, which is in press in the journal Environment & Planning B and will discuss highlights of a model developed with Drs. Min Yu and Jonas Floden on sustainable supply chain network competition and game theory with frequencies of supply chain activities as strategic variables and product path flows. This paper was recently published in the journal Computational Management Science in a special issue devoted to Planet Earth. Where has the academic year gone? We are now in the final weeks of a very busy semester and yesterday we had the pleasure of hosting my colleague, Dr. Ryan Wirght, of the Operations & Information Management Department, in our UMass Amherst INFORMS Speaker Series, which the students of this award-winning chapter, help me to organize. This year we hosted 6 speakers, including Dr. Michael Fu of the Smith School at the University of Maryland, Dr. Les Servi of MITRE (both of whom I saw at the recent INFORMS Analytics Conference in Boston), as well as Dr. Mary Helander of IBM (who, coincidentally, was involved in helping to organize the same conference in terms of speaker selection), as well as Dr. Eric Gonzales, a recent great addition to the UMass Amherst faculty, who had been at Rutgers,and Dr. Adams Steven, another colleague of mine, who received hid PhD from the Smith School last year. Yesterday, was the grand finale, since it was the last speaker of our academic year! Dr. Wright's talk was on: “Towards a Behavioral Model of Online Deception Detection." 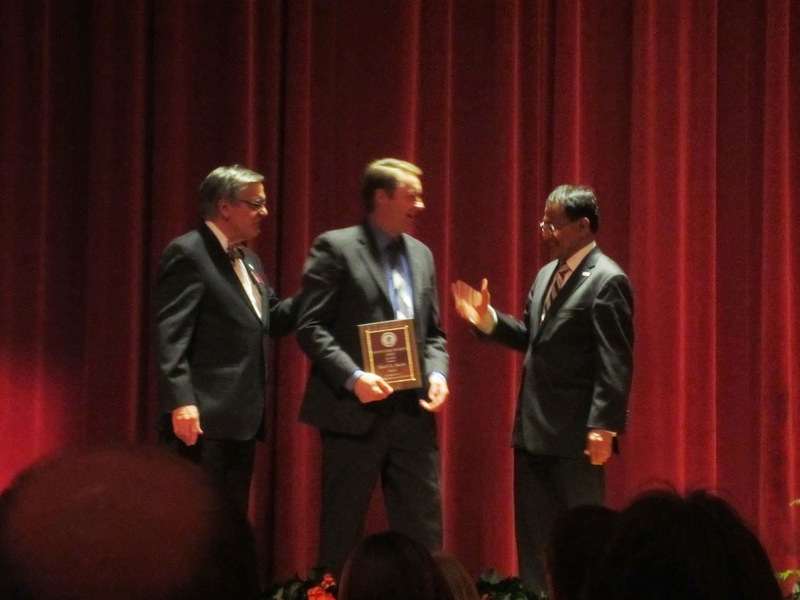 The audience consisted of students from the Isenberg School of Management and the College of Engineering as well as faculty. Dr. Wright began his lecture with an overview of the cybersecurity failures at both Target and Adobe and associated financial and reputational costs and took us on a journey of how to build a human firewall to combat such attacks. He shared with us his research, which is behavioral, and includes experiments (often with undergraduates as subjects), and findings, published in top IS journals, on phishing and human susceptibility and vulnerability, along with effective response training, including mindfulness training. The insights garnered are fascinating. Needless to say, the audience had many questions, always a sign of an outstanding speaker and presentation. Top lesson: be aware and think before you click on a "suspicious" link. Don't use technology mindlessly. I took the following photos of Dr. Wright lecturing yesterday and with some of the audience members. Given that it was a Friday, and Monday is Patriot's Day here is Massachusetts, which is a holiday, plus the day of the running of the Boston Marathon, we were so pleased that the talk attracted a standing room only audience. And, yes, the second photo below, illustrated an analogy between phishing and fishing - think of that url as a "hook." I always say, you have a great topic and speaker, you promote it appropriately, and we did, and they will come! I have written tips on organizing a successful Speaker Series, which you can accessed here. 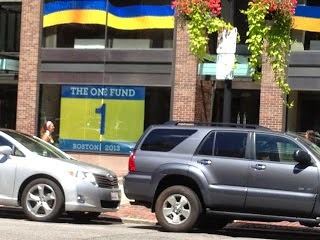 Today we marked the one year anniversary of the horrific Boston Marathon Bombings. This day in western Massachusetts is filled with strong winds and torrential rains as though nature is crying, too, for the 3 lives lost, the over 260 injured, and for our community being transformed. 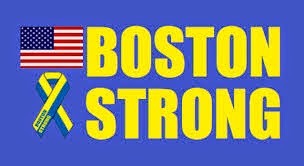 It is a year of blue and gold with Boston Strong becoming a symbol and mantra for resilience. and also the colors of Boston Strong. A friend and colleague of mine, Dr. Alla Kammerdiner, who is Ukrainian, and who I saw last February at a conference at the University of Florida and whose session on cybersecurity I spoke at at the INFORMS Minneapolis Conference (and we were videotaped)., ran the Boston Marathon last year and I wrote about her experience on this blog. I reached out to her this past week as the anniversary was approaching. 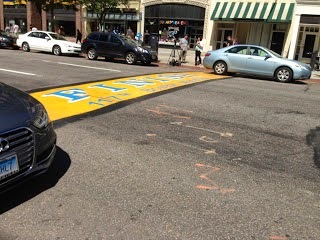 She will be returning to Boston and will be running the 2014 Boston Marathon next Monday. 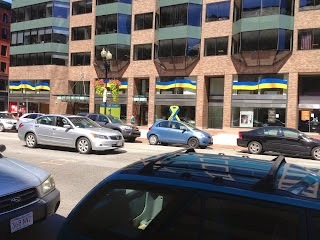 The Ukrainian flag is featured below and when I see the Boston blue and gold banners I am always reminded of Ukraine and the will of its people to be free despite what seem to be insurmountable challenges. The blue stands for the blue of the sky and the gold for the color of the fields of grain since, for many years, Ukraine was known as the breadbasket of Europe. And this year, as in the two previous years, whenever I return to the University of Gothenburg in Sweden, where I am a Visiting Professor of Operations Management, I am surrounded by blue and gold with the Swedish flag unfurled on many stately occasions and even the trolley flying what, to me, looks like the Ukrainian flag. For all those out there, never give up your dreams of freedom and thanks for all the acts of courage and integrity! Spring has arrived in New England with warm temperatures and the snow has finally melted. It has been a very busy couple of months at the Supernetwork Center at the Isenberg School of Management at UMass Amherst. It is a privilege to serve as the Center's Director and to work with such great students and colleagues. The latest edition of The Supernetwork Sentinel is now out and it is filled with news about various events, including conferences, accolades, upcoming activities, and highlights of our latest research and teaching activities. The full newsletter can be downloaded here. Thanks for the wonderful support from around the world. Working with the Supernetwork Team pushes research, teaching, and service to new heights because of great teamwork and thee associated synergy. The next edition of The Supernetwork Sentinel will be out in the summer. 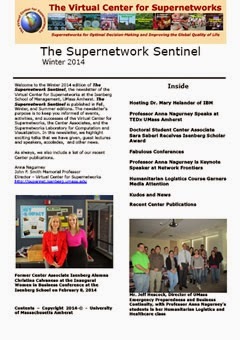 For all editions of our newsletter please visit the newsletter page on the Supernetwork Center website. Yesterday, several students from the Isenberg School of Management spent the late afternoon with me at the Mullins Center in Amherst where an emergency sheltering exercise was being conducted involving hundreds of volunteers, including many students (kudos to nursing and others), and multiple organizations such as UMass Amherst and the Medical Reserve Corps of Hampshire County. Some of my students are overnighting there on cots to learn from the experience and since they work as interns in emergency preparedness or have been fire fighters. We were especially interested in this well-timed major emergency preparedness exercise since I am teaching a course this semester at the Isenberg School on Humanitarian Logistics and Healthcare. Mr. Jeff Hescock, who was one of five guest lecturers in my class, and who is the Director of UMass Emergency Management and Business Continuity was one of the leaders of this fascinating sheltering exercise. The Mullins Center is usually the venue for basketball and hockey games as well as major entertainment events and to see it transformed into a shelter that could serve as a refuge after a natural disaster, such as a tornado or winter storm (and we have had our share of these as I have written about many times on this blog and in various OpEds). Two of my students and I, along with town officials, such as our Town Manager, John Musante, and our Fire Chief (it was great to see them both and my students were impressed), received a grand tour from an Amherst Public health official who was wonderful. The photos that I took at this special community event that I have posted here illustrate the scope of planning involved. The setup began at 1PM with the shelter opening at 3PM to simulate a real-life sheltering response to a natural disaster. 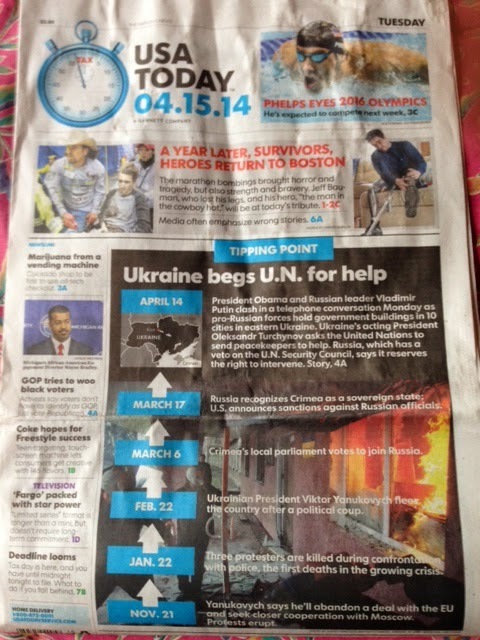 Since those who are being sheltered become a society for a time period safety and rules are important. There were registration desks upon entry and those who had volunteered to be "victims" had tags given to them describing their injuries which were made to look quite authentic. The Mullins Center had an area with cots, an area for dining, and the menu looked quite great. This emergency sheltering exercise involved not only adults but also children as well as animals and the attention to detail was truly remarkable. Children had their own area which was supplied with books, activities, and toys. Cats were separated from dogs, who were in crates and there was an exercise area for the latter and a radio was playing for the former. We were escorted by Ms. Carol Hepburn, who is Amherst's Animal Control Officer and a legend. She used to visit our neighborhood quite often back in the day. There was also an area for exotic animals including the dragon in the above photo. An exercise area for animals was constructed outside of the Mullins Center featured in the photo below. We spoke with a variety of the volunteers from organizations such as the Red Cross and the Medical Reserve Corps as well as the animal care individuals who came with their trucks from central MA and from the Berkshire area. There were even dogs to assist those who needed emotional assistance and reassurance. The adorable, huge Newfoundlander came with his owner and handler from Rhode Island. I look forward to hearing from a student later today on how the overnight experience went. He had packed up a big sleeping bag with a pillow and snacks and was prepared. The Medical Reserve Corps also had, for distribution, backpacks with First Aid kits, flashlights and a formd in a folder on which one could write critical information to keep handy. I congratulate all involved on this very important exercise which demonstrates the best of town and gown cooperation!